I was disappointed in the quality of these drapes. We have a 40' Monaco motorhome. We paid nearly $500 for the 3 panel windshield drapes. The drapes are not even close to the quality of our original drapes. The material is not even half the weight/density/quality of the OEM drapes. The new drapes let in considerably more light than the originals and the pleating is a single fold. Where the panels join there are only two Velcro strips rather than three on the OEM drapes, we have to pin the lower portion of the drapes for privacy. In my opinion the new drapes actually make our unit look cheap compared to the OEM drapes quality. It was very easy to place the order. Very friendly folks on the phone helped walk me though the process. Drapes fit perfectly and look great. Excellent quality and pretty quick turn around. Thanks for all the help. 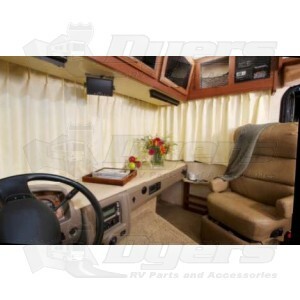 Ordered the cork colored curtains for the front of our RV. The color is gorgeous, the fit perfect and the curtains block enough light. We are planning on ordering more curtains for the rest of our windows. We are very pleased. Just got my privacy curtains today & hung them..I love them!! Outstanding quality/fit/finish..chose the lentil color & it just compliments my leather furniture & carpets in my '04 American Eagle beautifully..way better that the original cork color & quality that came with the coach from the factory...these people know what they're doing & it shows...22 days from order to delivery! They referred me to the vendor Dyers RV Parts & Accessories..good call since my local Camping World didn't want to handle the order at all..& they also are one of Gary's vendors..kudos to Karen at Gary's for taking charge of that issue & getting me to Dyers who handled my order seamlessly. Company was easy to work with, questions were responded to in a very reasonable time. Product arrived within the timeframe given and fit perfectly. It was a pleasure doing business with the company and will use them in the future if needed.